The 2017 NBA All-Star Weekend is behind us now. Hosted by the city known as the Big Easy, it was shared with its world-famous Mardi Gras celebration. The dual merriment made New Orleans the perfect place to be and the city took a big step in regaining its spot as the choice host city of one of professional sports’ biggest celebrations. In New Orleans, everybody is somebody. Langston Galloway (No. 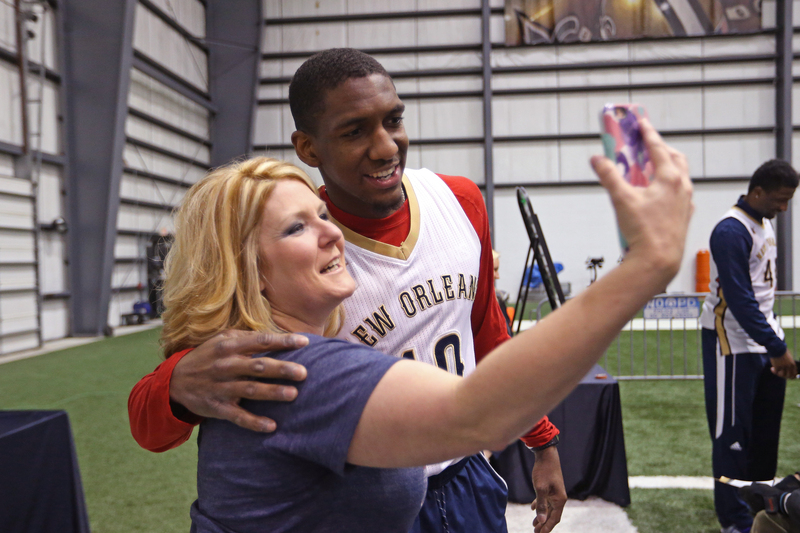 10) of the New Orleans Pelicans takes a selfie with a fan as the Pelicans hold their annual season ticket sales event on Jan. 28 at the New Orleans Saints/Pelicans practice facility in New Orleans. Galloway, a Baton Rouge, Louisiana, native, stopped to ponder what he’d missed most about living away from Louisiana. The 25-year-old left his home state after signing with the New York Knicks as an undrafted free agent in 2014. After contemplating his answer, a sly grin appeared, eyes lighting up as the answer came to him. He smiled. It had been four months since Galloway said goodbye to the Knicks, where he played in 127 regular-season games and started in 48 over two seasons. He debuted his new team’s jersey, proudly donning the Pelicans logo — the name is inspired by Louisiana’s state bird — and looked forward to a fresh start in a city he already knew. Three days after discussing his love for the city, his appreciation for its culture, the best remedy for his homesickness, Gallloway’s time in New Orleans was up. In breaking news announced immediately following Sunday night’s All-Star Game, basketball fans learned that Galloway, along with teammates Tyreke Evans, Buddy Hield and two 2017 draft picks would be shipped out west in a blockbuster trade for the dominant Sacramento Kings center DeMarcus Cousins and forward Omri Casspi. Galloway was gone before he was able to sport his home state’s jersey in his first game start. Flashback to the weekend: Thousands of athletes, celebrities and basketball fans poured into New Orleans for an action-packed weekend. Over the course of the three days, interactive NBA sessions provided family fun. On Feb. 18, some of the NBA’s most skilled hoops players showcased their skills and everyone cheered gleefully as Indiana Pacers guard-forward Glenn Robinson III was awarded a trophy for winning the NBA Slam Dunk Contest. On Sunday night, parades rolled down St. Charles Avenue, and NBA players stopped to catch beads and doubloons before walking over to the Smoothie King Center to witness home-crowd favorite, Pelicans forward Anthony Davis, who put up 52 points in the All-Star Game. Davis broke Wilt Chamberlain’s 42-point record, which had been untouched since 1962, leading the West to a 192-182 victory over the East. He was also named the game’s MVP in his fourth All-Star appearance. In a postgame interview, Davis — who assured beloved Pelicans fans he loved the city too much to leave it — described what the win and All-Star Weekend meant to him and New Orleans after tornadoes destroyed several neighborhoods in the city. Welcome to New Orleans — the city where strength and faith guide our steps while allowing us to rebuild and restore. Hurricane Katrina didn’t break the city. Floods and tornadoes won’t shake the city. The resilience is built on a culture that embodies hard work and dedication. The citizens don’t take knockouts. It’s a place where we celebrate our sorrows along with the joy we feel when we’ve overcome yet another obstacle. A city that proves we are bigger and stronger than any hurricane or tornado will ever be. The moral compasses of New Orleanians are embedded during childhood, and filled with messages from parents, relatives and neighbors who preach love and acceptance of everyone regardless of race, color or creed. When it was announced that Charlotte, North Carolina, had lost its All-Star host privileges, New Orleans immediately became the front-runner. Much like the journey of this year’s All-Star Game, spontaneity and unpredictability are woven deep into the fabric of New Orleans’ rich culture, and not just reserved for sports. It is a place that — to let tourists tell it — feels more like a standalone country within America. Visitors unfamiliar with Louisiana’s laws are often shocked when bartenders ask if they’d like their alcohol to go. In this magical city, there’s no judgment for choosing an adult beverage over coffee with your breakfast. If anything, a patron will join in and do the same. NBA All-Star Weekend paid homage to NOLA’s art scene by enlisting the help of local artist Brandan “B Mike” Odums and his art studio, Studio Be, for Nike’s recently launched Equality campaign, geared toward leveling the playing field not only in sports, but in society as a whole. “Equality should have no boundaries,” reads the website. “The bond between players should exist between people. Opportunity should be indiscriminate. Worth should outshine color. The ball should bounce the same for everyone.” Strangers become friends who sometimes turn to family. In this city, a dollar and a dream, especially a dream, are all you need to make it. It has always been the unofficial mission of New Orleanians to leave a lasting impression on those we come into contact with, even if it comes by way of a simple hello. In this city, my city, you come as you are and leave better than you were before. As the lights began to shut off in the Smoothie King Center, stragglers who weren’t quite ready for the night to end roamed the streets of the city’s Central Business District in search of fun. In New Orleans, you don’t have to look too far. The continual party is right around nearly every corner. From the city of resilience and unabashed pride, we hope you enjoyed your stay.